It's been some years since we established this property broking business. We have helped many people settle in their dream homes and offices. We are professionally qualified to understand your property requirements and propose a win-win solution. We believe, if given the opportunity, we will be able to obtain the best deal - for you. 1.) ALL TYPES OF RESIDENTIAL RENTING PROPERTY AVAILABLE CLOSE IN SOUTH DELHI & NOIDA. 2.) AVAILABLE 1,2,3,4 BHK ACCOMODATION FOR RENT AT C.R.PARK ,KALKAJI,EAST OF KAILASH,LAJPAT NAGAR,GK-I,II,III,IV NRI COMPLEX,ALAKNANDA,PAMPOSH ENCLAVE,DEFENCE COLONY,NEW FRIENDS COLONY,PANCHSHEEL ENCLAVE CLOSE IN SOUTH DELHI LOCALITIES. 3.) COMMERCIAL PROPERTY AVAILABLE FOR RENT AT OKHLA INDUSTRIAL AREA. 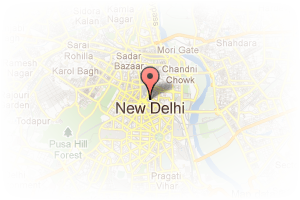 Address: F-36 A, Kalkaji, New Delhi, Delhi, India. 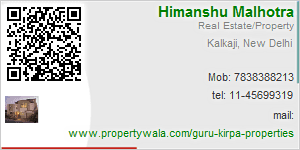 This Broker Profile page for "Guru Kirpa Properties" has been created by PropertyWala.com. "Guru Kirpa Properties" is not endorsed by or affiliated with PropertyWala.com. For questions regarding Broker Profiles on PropertyWala.com please contact us.